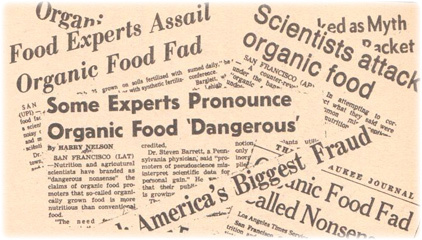 Big Agriculture's agenda was, and is, to kill organics. Well, that was four decades ago. But have things changed? It turns out certain "scientists" are still being enlisted to defend Big Agriculture and its "better living through chemistry" agenda. Several months ago, the American Association for the Advancement of Science was back at it again, declaring "the science is quite clear: crop improvement by the modern molecular techniques of biotechnology is safe." In other words, GMO-laced food is healthy. The American Medical Association got in on the act too, pronouncing "The main conclusion to be drawn from the efforts of more than 130 research projects, covering a period of more than 25 years of research and involving more than 500 independent research groups, is that biotechnology, and in particular GMOs, are not per se more risky than e.g. conventional plant breeding technologies." Naturally, these announcements from the AAAS and AMA were made around the time that Californians were going to the ballot box to decide whether GMO labeling should be made mandatory. No coincidence there. Organic, local food is a major threat to Big Agriculture, whose business model is built around chemicals, animal confinement, and transgenics. Over the decades, Big Ag has succeeded in getting the civil government to protect their oligopolies through legislation. But their reach extends deeply into the scientific community as well. Grant money. Endowments. Funding for research. Opportunities for career advancement. All these are levers by which Big Ag influences academicians. The money directs the research. The money controls the message. But here's the good news. Consumers are no longer being duped into believing that pesticide-ridden produce and transgenic crops are healthy for them. They're focusing instead on foods that are grown traditionally, sustainably. That's encouraging. Each food dollar that goes to local, organic family farms is one more dollar which gets diverted from the conventional food system. It's resulting in positive change --- and that's healthier for people, the animals, and the planet.